The oppressive midwest summer is just really getting started up and I’m already praying for winter. No matter the temperature outside, I still have to go to a park twice a day, so Aggie and run for an hour. That means I’m out there too. But I’m keeping an eye on the blackberries (my favorite thing about summer) and looking for other tibits that might get me through the heat and humidity with at least some of my sanity. 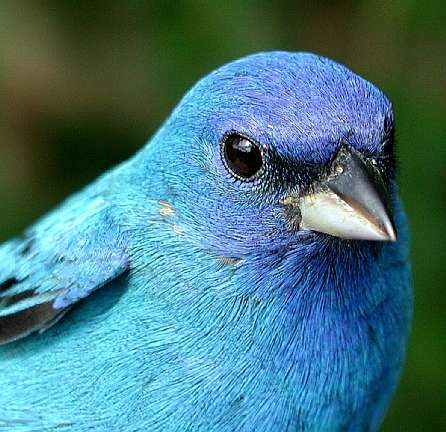 The other day I saw an indigo bunting – a small blue bird, with a deeper color than a “blue bird”, and no red breast. I think there are a few pairs in the park I normally walk in, but I know there’s at least one. I love this little bird, almost more than a blue bird, I think. They’re less well know and fewer people are likely to see them, because they prefer abandoned areas and not subdivisions and such. Too cool about using the stars! I didn’t know birds could do that! Our God is soooo amazing! ps. Our God’s timing is perfect: I felt I was to finish gardening before starting any of the other projects waiting at home. Done Saturday. Just in time before the humidity got out of control! The dogs want in everyday before 11am! Geez. A dog’s life must be nice: eat & sleep. I held one of these indigo buntings in my hands, while I was taking one to the a vet clinic a few months ago. They are stunning creatures!